Q: How many years has your team been in existence? First race was Noosa 2011, we are now in our 6th year of existence. Q: You’ve had a few sponsor changes over the years, is it difficult to be constantly looking for new ones? We have been extremely lucky to have the support of Specialized Australia since day one. 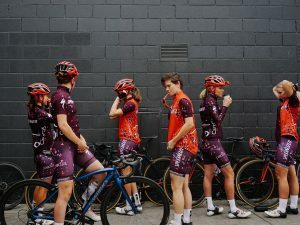 We have had a few sponsor changes along the way but our philosophy has been to have strong long term relationships with our partners, who are as passionate as we are about the team and women’s cycling in general. Finding new sponsors is certainly difficult but we don’t go looking to sign any sponsor just for the sake of it, we are about quality not quantity. Q: The women’s National Road Series (NRS) has a fairly low profile compared to other Australian women’s sport, what can we do to improve it? This is a very tricky one and there are plenty of different views about it. Personally I believe success starts at the top, strong leadership is the only way to force change. Cycling Australia recently received new leadership and there are some great people working on the NRS who are passionate about the sport, so I’m interested to see how things unfold over the next year. The other key is making women’s cycling more marketable to the general public, rather than just the cycling community. Making the races more accessible and viewer friendly would certainly help plus marketing the riders effectively on social media. Q: I believe you used to be rider on the team. Is it easier to just focus on team management? Correct. I started the team when I was nearing my retirement and it’s been great to stay involved in the sport I love. To be completely honest, team management is extremely time consuming. Whilst I no longer have to put in the training hours or manage pre-race nerves, there is a lot of work involved in running the team which most people wouldn’t realise. My role predominantly consists of finding and managing sponsor relationships, arranging team logistics for races, ordering and distributing product, managing the team website and keeping in contact with my riders to make sure they’re happy and have the support they need. With 8 riders, 3 staff and 6 sponsors it gets pretty busy. One of the challenging things about my role over the years has been managing conflict, I’ve learnt a lot about how to resolve a sticky situation, whether it be with a rider, or a parent, or a commissaire, I’m constantly learning. Q: How many team members are on the roster? Do they get to train together or is it an individual responsibility? We have eight riders on our roster and we are spread all over the place: two in Melbourne (Kate P & Verita), three in the Albury/Wagga area (Maddy, Taryn, Sophie), Lucy in Canberra, Ella in Sydney and Kate Mc all the way over in New Zealand! Some of the girls do train together but we only come together as a team for races and training camps. Each rider has their own individual coach and different personal goals and many diverse strengths across the team. Q: Do you still ride on a regular basis? What drew you to cycling as a sport? I don’t get much time to ride any more, I have 2 little kids who take up every waking hour, so getting out for four hours on a bike isn’t exactly time-efficient. I run nearly every morning, even if I only have 20 minutes. It’s a great way to start my day and I figure it’s better than nothing. On my run I often think up new ideas to improve the team or think of ways to solve a problem. I first started cycling through a Talent ID program for track sprinters. I was drawn to the high speed of the velodrome and eventually developed a passion for the road as well. I love the social aspect of cycling, it’s a great way to catch up with friends and you meet so many different people from all walks of life. Discovering new places and riding through beautiful parts of the country is also a very special part of cycling. Q: What can we all do to encourage more women to ride bikes? I think safety is a major concern for new riders, so teaching them how to signal and ride in a bunch is very important. Getting involved in participation or charity rides is a great way to give it a try in a relatively safe environment. Have you seen the Specialized Women’s Team in action? We’d love to hear from you via comments or the Women Who Cycle Facebook page.